In thinking through the conversations at the FMI Executive Forum Roundtable discussions last June, and in other conversations with fresh grocery leadership since then, it has struck me that there was a lot of consensus on the issues of the day, and how solutions to the challenges are a lot more difficult to find that same level of consensus. Even in examining the accompanying infographic along its topics the same holds true, i.e. common sense insights on challenge, but what to do? Perishables have long been the forgotten area for technology application due largely to its myriad of unique characteristics. Rapidly changing source of supply, hyper visible quality, random weight measurement, digital techniques to manage or rather lack of and difficulty managing demand measurement all contribute to its lack of innovation from a technological foundation perspective. Throw in the home delivery parts of the discussion and we begin to understand the road ahead for a digital solution. In many ways, there is an opportunity to tackle this area that haven’t been available before due to better tracking methods, better ways of identifying source of supply, better demand sensing techniques that make for a better supply chain efficiency outcome. The talent topic will be a tricky one in the years to come. This is not just true in grocery, but on a macro level as robotics, machine learning and Internet of Things applications cause havoc in what defines the next generation worker. It is far easier to not think through these macro trends than to ponder their implications. We are at the early stages of this massive shift, but some deep analysis of what defines the company – employee relationship will impact this area and need to be thought through. Google often talks of a world where there are far fewer jobs due to automation, but the consequences of that are hard to envision fully. 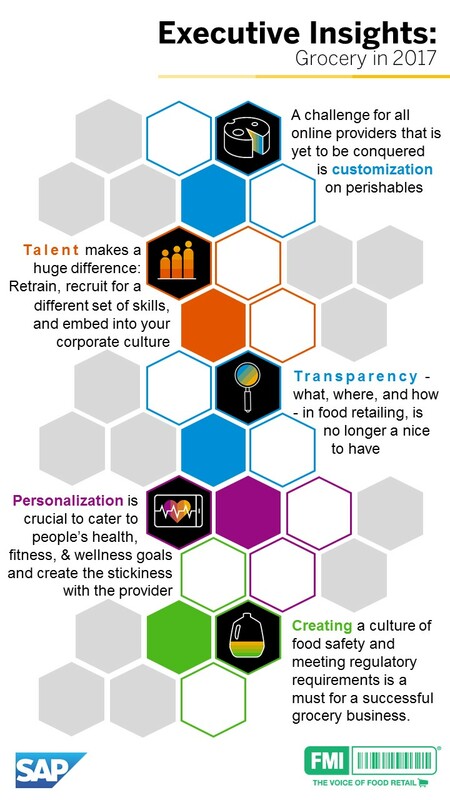 Personalization is possibly the best way of attracting and retaining customers. If I think about the ways this is done today it is largely a facet of the development and application of the marketing insight industry. The challenge largely is that this tends to lead to a rolling campaign/sampling approach due to scale constraints; therefore, you’re always only communication with a small fraction of the customer base at any point in time. The supply chain is almost completely disconnected to the digital marketing realm. The good news is that there are ways to start connecting newer digital signals to the supply chain and ways to create scale in personalization. The real question is where to place your bets, in what order and sequencing? This is where the real work must begin and requires attention and time to reflect and discuss as there is broad impacts to the organization and capital investment budgets. The following resources can be leveraged to guide a framework for planning around these investment choices. I hope you will dive in and start your conversation. We appreciate the partnership we have with SAP on diving into digital, supply chain and related operational areas.